Decades ago, Walmart changed the picture of retail in the American market and altered the economic balance by shifting power from manufacturers to retailers. By forcing decline of small, local, old-school stores through lower prices, Walmart paved the way for the magnanimous stature that it has now. The retail scenario is changing again. This time, by e-commerce. E-commerce has disrupted the way people shop. In this fast-paced world, people are tight on time and online shopping has come to their rescue. It incorporates the two major factors – technology and sustainability – that the modern, tech-savvy, environment-conscious consumer looks for while making a purchase. Every big and small retailer today is working constantly to make these digital platforms robust and secure. E-commerce giants such as Amazon, eBay, and Alibaba are becoming the Walmart of online shopping. Quite evidently, digital transformation has revolutionized the consumer behavior in terms of their purchasing pattern and check-points. Hence, knowing the opportunities and challenges in the digital space, a lot of attention is driven towards Digital Assurance and Software Testing. Can Brick-and-Mortar Stores Exist Without Embracing the Digital Disruption? The benefits of e-commerce are attractive, both for sellers as well as buyers. The geographical limitations of a physical store are not a concern for an e-commerce platform. Going online has allowed businesses to market and sell their products worldwide, presenting them with the possibility to expand their customer base exponentially. 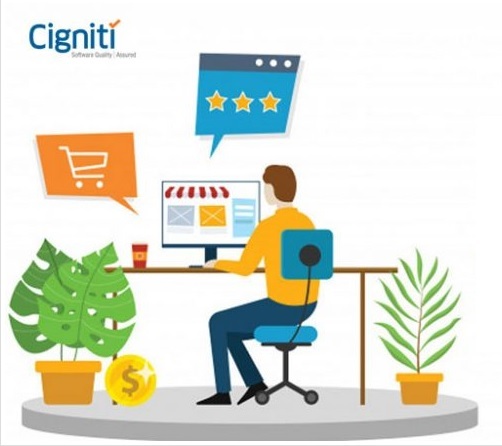 E-commerce enables sellers to offer better variety and range to their customers by analyzing their buying history and purchasing pattern. With minimal investment, e-commerce drives higher revenues, as online businesses do not have to spend exponentially on building stores or paying rent, furniture, installations, and electricity. Omni-channel advertising becomes significantly cheaper with social media, eliminating the need to hire and pay sales and marketing personnel. Although, e-commerce is not completely ecological, it relatively helps in reducing the carbon trail in many ways. The major emissions for e-commerce come from the heavily-powered data centers and the additional packaging material required to ensure safe delivery. But, there is nothing that cannot be moderated. Deployment of renewable energy resources and recycling the packaging materials provide e-commerce the scope to emerge as the sustainable option of retail. Having said that, there are still many who find a sense of security in traditional shopping and would prefer a personal service at a physical store over a few clicks on a mobile shopping app. Traditional shopping also lets customers to take the merchandise home the very same day, while they have to wait for a few days to get an online order delivered to them. The waiting period may kick in anxiety in some buyers, making the "retail therapy" useless. Possibly, e-commerce will not kill traditional retail immediately. It may lead to a slow and painful death, if the retail stores fail to evolve with the changing time, implying that there has to be a balance to ensure omni-channel experience. The decline of old-school retail stores with the rise of big-box retail has taught businesses one thing- To stay in the game, you must adapt with the change. The soaring e-commerce success has led the retail behemoths to take the cue and adopt an appropriate strategy to stay competitive and relevant. The acquisition of Whole Foods by Amazon and Flipkart by Walmart shows the trend of cross-format deals that traditional stores are taking to save their face. The popularity and ease of online shopping over offline cannot be ignored. In such scenario, convergence becomes the key to survival for brick-and-mortar stores. Developing a hybrid model, in which they offer the convenience of online shopping while maintaining a physical space to interact with the customers, is their best bet. Here, Enterprise E-commerce application testing and Software quality assurance solutions will play a key role. This facilitates an Omni channel presence of retailers, empowering them to tap on maximum customer touch-points.